KUNMING: An ox-cart rode along a bumpy road in the suburbs of Yunnan's provincial capital, carrying a woman and her thirsty 9-year-old son to a water reservoir several kilometers away. For more than an hour, no one spoke. The rattling of the cart almost echoed on the long and empty stretch. The cart stopped at the Tuanjie reservoir. The woman and her son rushed toward the water, as if their throats had been parched for days. They splashed some water on their faces and drank a bit, and then filled up a huge tank kept in the back of the cart. Finally, breathing a sigh of relief, 30-year-old Qian Guancun, a native of Kunming's Shilin county, said, "We have had to do this (make this trip) every two days, since our village's water vault went dry." Qian said all the crops in her field have been destroyed, with no rain for months. "We seldom buy vegetables since we are short of funds. For most of our meals we eat pickle." For hundreds of other residents of Nanhua county in Chuxiong, the situation is pretty much the same. According to the Yunnan provincial government, the continuing drought had hit more than 24 million people by Thursday, with 8.28 million people and 18.9 million animals struggling to find drinking water. 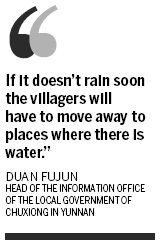 "If it doesn't rain soon the villagers will have to move away to places where there is water," said Duan Fujun, head of the information office of the local government of Chuxiong in Yunnan. In villages like Yijie, Hongshipo, Luowuzhuang and Majie, which are located on mountains, 50 percent of residents are likely to have no drinking water at all if the drought continues due to lack of water resources and roads to transport water, Duan said. "We must start preparing for the worst," he added. The Water Resources Bureau of Nanhua county said that its water reserve would last no more than 45 days, adding that there is a plan in place to move people closer to other water resources until rain arrives. Ouyang Wenlong, an official with the bureau, who hasn't had a day off since last August, however, said that moving people would be the last resort. "The minimum requirement for combating a drought is to guarantee the delivery of drinking water, either by van or manpower. But for the residents of the four villages, located on the mountains, with neither water nor roads, it's hard to survive," he was quoted as saying in the Nanfang Daily. This is not the first time Nanhua residents are facing temporary relocation due to the drought. During a drought in 2005, some 2,000 villagers were moved to the nearest water source with the help of the local government. They lived in camps for more than 20 days before returning to the villages. But this year, the drought is more serious than it was five years ago. And the population has risen to about 6,000, Ouyang said. "In 2005, the villagers lived in the camps for about 20 days. But I'm afraid this time it could be for a lot longer," he said. He said the moist season usually begins in May, so the chances of moving the villagers are high. Wang Junqiang, the Deputy Secretary-General of the Yunnan provincial government, told China Daily that 4.43 billion cubic meters of water are in the province's reservoirs, adding at least 100 million cubic meters is being consumed every day. "The water will be gone in 44 days. But the meteorological department says it won't rain before May." Even as people in Nanhua are craving water, just about 10 km north in the Mi'nonglu valley there is plenty in the reservoir. In 1995, the valley was classified as a natural protection area because of its unique ethnic customs. "Ecological conservation has surprising results," Ouyang said.